In the last entry we were boondocking along the shores of Keechelus Lake in the Washington Cascades beating the summer heat. If you know me, or have followed this blog for any length of time, you know that I am not one to sit still for very long, so spending a whole day lounging under the RV awning next to the beach tends to get me anxious for a little exploring. Thankfully, just across the freeway from our idyllic boondoking location is Gold Creek Pond. The pond was created when gravel was mined from the site during the expansion of I-90 in the 1970’s – early 1980’s. Today Gold Creek Pond offers travelers a scenic stop from their journey along I-90. 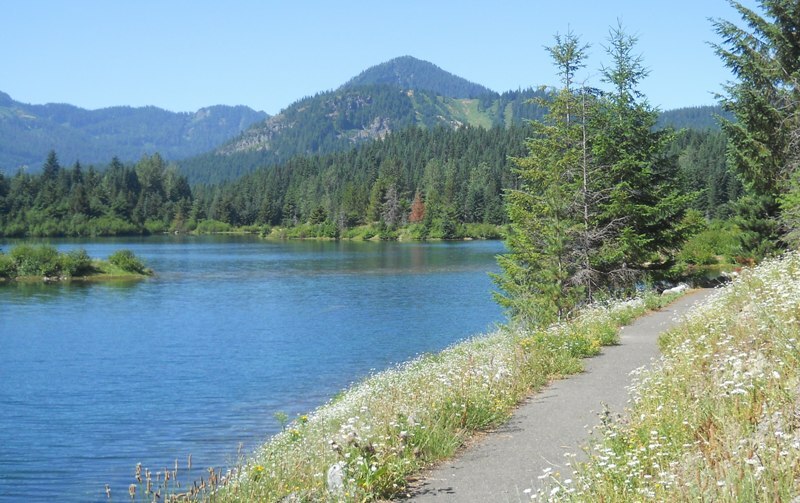 For those looking to stretch their legs, the pond features a one mile loop trail around the perimeter.The trail is paved and ADA accessible providing ample opportunities for scenic views up the Gold Creek Valley, Chikamin Peak, Alta Mountain, the pond itself and the chance to see wildlife (especially in the evening). As you walk the loop look for signs of beaver activity. The area also features a picnic area with tables and fire grates. After visiting the pond you will find it hard to believe that this peaceful place was once an ugly hole in the ground teeming with heavy equipment and construction workers. Exploring old gravel pits turned scenic wonders, just another adventure in RVing! – To get there: Take exit #54 off of I-90, head north (left for east bound travelers, right for west bound ) and turn right on Forest Service Road #4832 that parallels the north side of the freeway. Drive 1.0 mile, turn left on Gold Creek road #142 and turn left in 0.3 mile into the Gold Creek Pond parking lot. Sounds like a nice location to visit when we pass the area travelling south from Victoria. Would be a nice spot for a picnic on a hot summer day.